LIMBO can finally be played natively on Linux thanks to Ryan "Icculus" Gordon and his porting magic. If you don't remember LIMBO came in a Humble Indie Bundle and caused a wee bit of a stir when people noticed it wasn't native. Glad we can put that behind us now! Kudos to Ryan for porting and Playdead for allowing him to do so! As this is an SDL2 port it should work beautifully, and brings controller support too. You can pick it up at Humble Store if you don't own it already or fancy gifting a copy to say thanks. 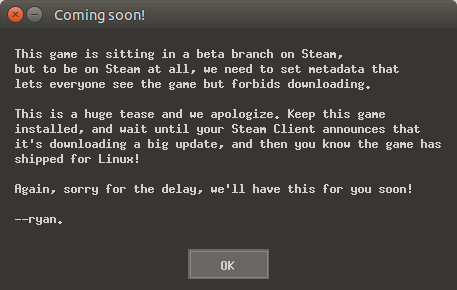 And yet here we have Limbo for Linux. Natively. Thank you, Playdead and icculus. That is how you build good will. I can tell which game I'll buy and gift and which one I won't. Limbo is much more easer to test. I think it is very hard to compare these two games. My first two bullet points tackle that rather nicely. Civilization 5 is another example, though, as is Trine. CD Projekt RED, being all about good will, certainly screwed up here compared to other developer studios. LIMBO still hasn't updated itself in my steam library. On the other hand, it has been updated on the humble store. MayeulC LIMBO still hasn't updated itself in my steam library. On the other hand, it has been updated on the humble store. Very nice of Ryan to set that message, he's awesome! I wonder what changed to make this happen though, as if I recall correctly, they previously claimed that it was some middleware that prevented this from happening previously. Did they replace it or did the middleware become native in the mean time? Icculus ported Wwise the middleware in question.